At this page you can find all our product categories for the BMW RnineT ✅ and its offshoots. 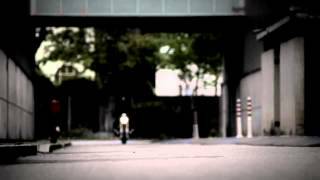 The RnineT family includes the RnineT, RnineT Scrambler, RnineT Urban G/S, RnineT Pure and RnineT Racer. With the air-cooled Boxer engine, a cylinder capacity of 1170ccm and 110 HP, the RnineT is an absolutely amazing motorcycle and very competitive compared to the "bigger" BMW bikes. The motorcycle is currently very popular as a conversion bike because of its simple composition. The handling of the RnineT series is very different and depends on the specific model. The RnineT Racer for example has a very sporty undercarriage, whereas the RnineT Urban G/S has an undercarriage which is very good for touring. 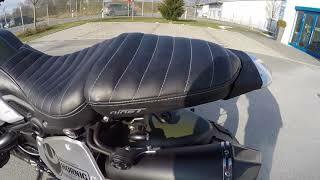 Among critics, the RnineT models are very popular for their uncomplicated composition and their lightweight. In the category Alu, High-grade Steel you will find many useful things like our crash bars, side stand enlargements or our mirror extensions. Furthermore, there is a great amount of products which sophisticate the visual appearance of the bike, like for example our frame covers. 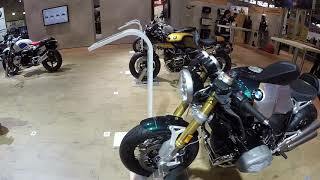 Moreover, we also offer windshields for the RnineT models which deflect the wind or improve the look of the bike. You will find our tank bags, two-piece load restraint assemblies or our seat changing service, which makes your motorcycle more comfortable, in the category Seats, Trunks & Bags. In the category Exhausts you will find some Remus and AC-Schnitzer exhausts, which make your bike more sporty and louder than before. In our Category Carbon Fiber, GFK you will find products like belly pans, rear huggers, different covers and much more (materials like GFK or Carbon are very often used in the race sport because of their lightweight). In our category Leds, Lenses, Bulbs you will find many spare parts like indicator bulbs or LED indicators. Moreover, you will find many special parts like our mini-indicators or the AC Schnitzer light bomb there. Our GPS Systems (Garmin, TomTom) and mounting kits for them as well as our interphone systems can be found in the category Navigation & Communication. We also offer spare parts and wear parts like brake pads or oils in the category Spares. Furthermore, we also have tools and diverse accessories like chargers, cables, plugs, lifters, outdoor and indoor covers and much more in our product range. Last but not least, you will find tires, clothes & stickers coupons and many books in our online shop.